Marc Demarquette is constantly innovating and pushing boundaries. One of the first UK chocolatiers to make the great leap from just using coverture to buying some beans direct and having it made into chocolate he then worked with, Mark is always innovating as well as flying the British flag. From his fruit caramels made with rare local fruit as well as well-known ones to his chocolate coated cobnuts, he’s always trying something new. He sent me a box of these caramels with his ground-breaking Theobroma Grandiflorum truffles and these caramels are as innovative and amazing as his truffles were. The idea behind tea and coffee pairing with chocolate has been around awhile but this is the first set of caramels I’ve tried and the first set of little baby cups I’ve ever had – these are darling! 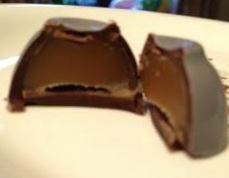 The tea and coffee caramels are on the site and are a new product which is going to be the absolutely perfect gift for a tea fan, Afternoon Tea fan, or for just any reason. Jasmine Tea – WOW… I love the balance of flavours on this one. 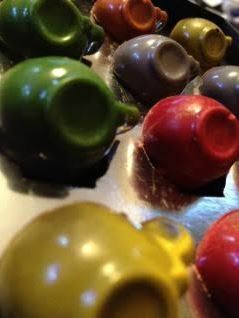 Everything works perfectly from the chocolate to the caramel to the intensity of the tea. 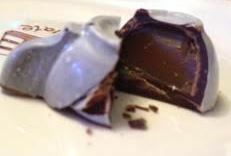 This is a delicious mini chocolate caramel cup and probably my favourite! That White Monkey Jasmine Tea is absolutely fantastic in the caramel giving it a delicate sweet tasting caramel. Yummy! Bedouin Coffee – This one I shared with husband but both he and I felt it wasn’t the best combination. Not sure why but there was something about the balance that just wasn’t as perfect as it was for the jasmine. The Arabian spices just jarred with our palates so we both just didn’t get along with it. That doesn’t mean you won’t fall in love with it – the coffee is strong as is the caramel and the dark chocolate makes it an intense flavour sensation. Earl Grey Tea – again wow but maybe not as massive. I’m getting a slight tannin bitterness in this caramel which also carries a lot of bergamot. I’m not sure but on this one it might be a lttle more than I am used to but that doesn’t mean you won’t love it! Like the coffee it’s all about individual laste and these are lovely and intense so if you like that, you’ll LOVE these! Darjeeling Tea – The only word I have for this is odd. The buttery caramel seems more buttery, the tea seems too soft and yet I can completely taste it. I don’t know but maybe the dark chocolate against the soft Darjeeling tea was just too much and so against that the tea melded into the background. Again, you might like that because it isn’t too strong on any one flavour but I’d have loved a bit more tea intensity without getting too many tannins. Chai Tea – wow again – the mx of spices, the amazing flavours of the chai is absolutely perfect. There is a funny nose of a bit of over-brewed tea which is exactly how I drink mine 😉 because nothing says comfort like over-brewed Tetley. This is again a really nice caramel with the flavour balance and the milk chocolate gives it a nice sweet kick. Overall the jasmine was my most favourite and the Bedouin coffee my least favourite. I would happily eat most of the caramels in this box and I think is it absolutely perfect. The way they are stored means the box arrives perfect and those little baby cups are so cute but also just the right size for the caramel inside. Perfect sizt, perfect flavour. GRAB A BOX ONLINE NOW.